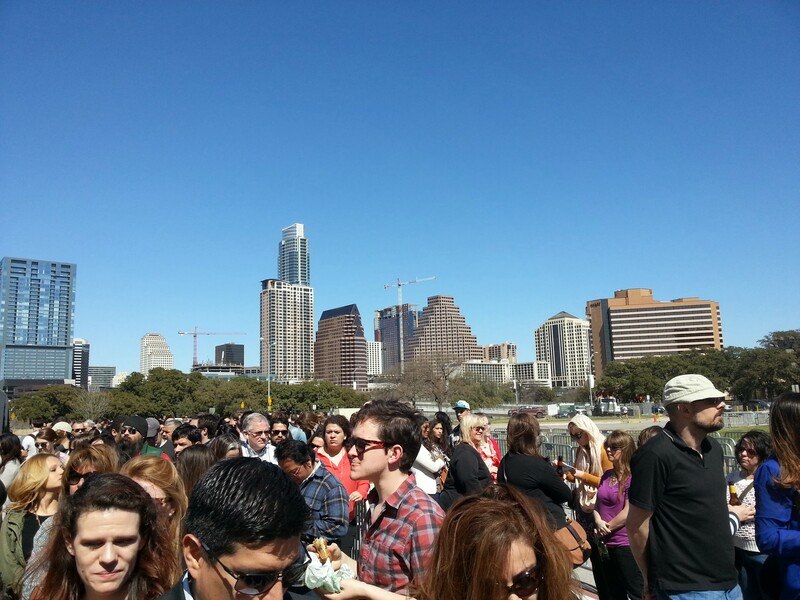 I had only seen Jimmy Kimmel’s late night show on ABC a handful of times ever, but when I heard he was bringing the show to Austin again this year during SXSW I decided it would be fun to be in attendance. The line for Kimmel grows longer. Lauren was obviously my original guest to bring along, but when she was stricken with a massive headache on Wednesday, I had to find a replacement or I couldn’t go, as all members of the party needed be present to attend. I scrambled to find someone to come along, and thankfully my Callaway co-worker Allison was able to take the afternoon off and join me. While in line, I recognized a familiar face, that of comedian Don Barris. I yelled “Don! Don!” and he seemed very surprised to be recognized. Few would recognize him unless you’d seen the movie “Windy City Heat” which aired on Comedy Central about 10 years ago. To this day it remains the single funniest thing I’ve ever seen. I own the DVD and would be very happy to lend it to anyone. Don and I had a friendly chat. He serves as Jimmy Kimmel’s warm-up comedian on the show, helping to get the crowd riled up and in a laughing mood. 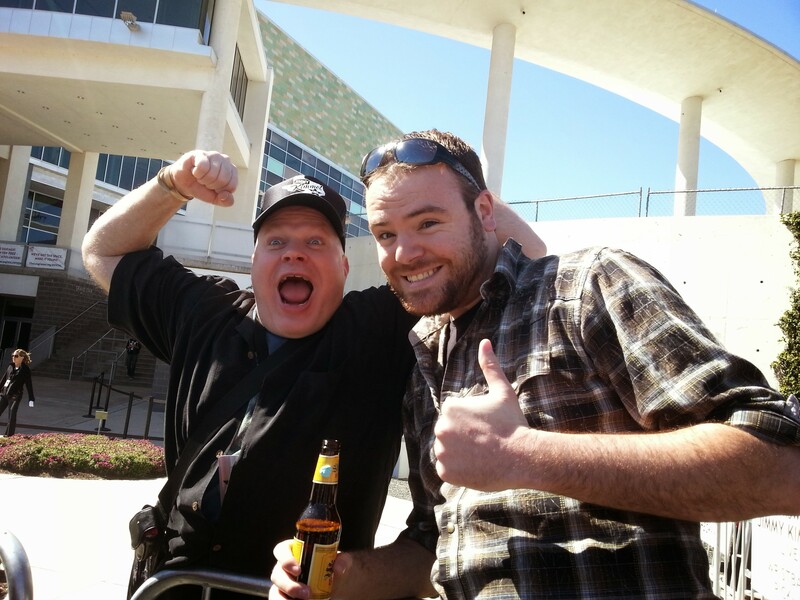 Me with Windy City Heat’s Don Barris. Once we finally got inside after over two hours of waiting, we waited another hour for the show to start filming. Jimmy eventually came out and the cameras started rolling, and I did my best to be visible to the TV audience. Guests for the show were actor Robert Duvall (of Godfather fame), TV foodie Rachael Ray, and the music stylings of Damon Albarn, the man behind Gorillaz and Blur. Can you find me? 7th row center, about 5 seats in. 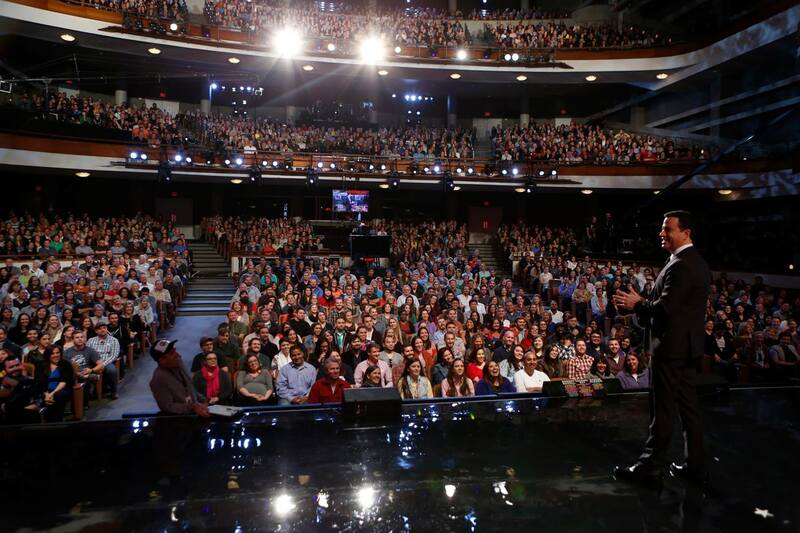 Just like my experience at Late Night with David Letterman in 2011, I watched the show again once I got home and paused many times trying to pick myself out of the crowd. The best shot of me was actually the back of my head during the musical performance. Look just to the left of the ABC logo. Yep, that’s my hair and shirt. Allison can technically also be seen but she is much shorter than me and is mostly covered by the ABC logo. 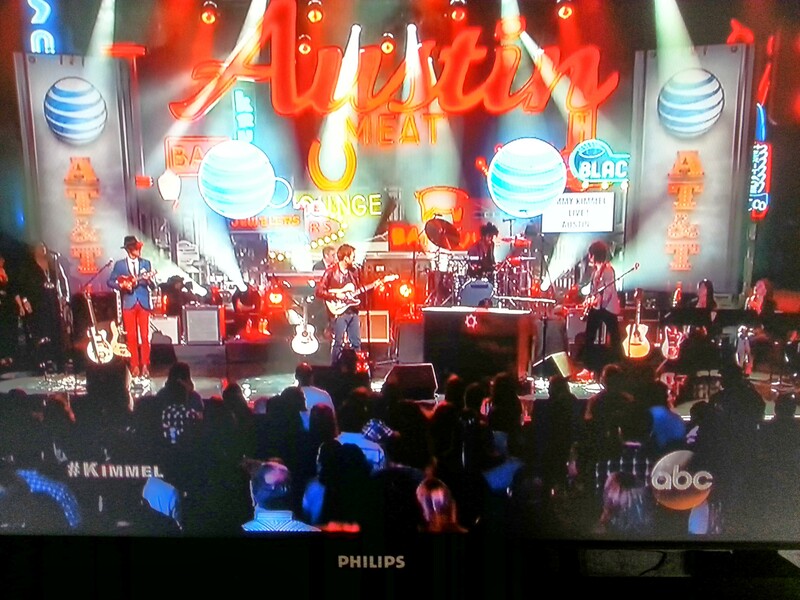 My head can be seen just to the left of the ABC logo in the bottom right corner of the screen. In other news, everyone at work converted to standing desks this week. And by “converted” I mean the IT guy went to Home Depot and bought a bunch of cinder blocks and we helped each other lift our desks on top of stacks of blocks. A bit hacky, perhaps, but everyone is excited to change things up a bit. 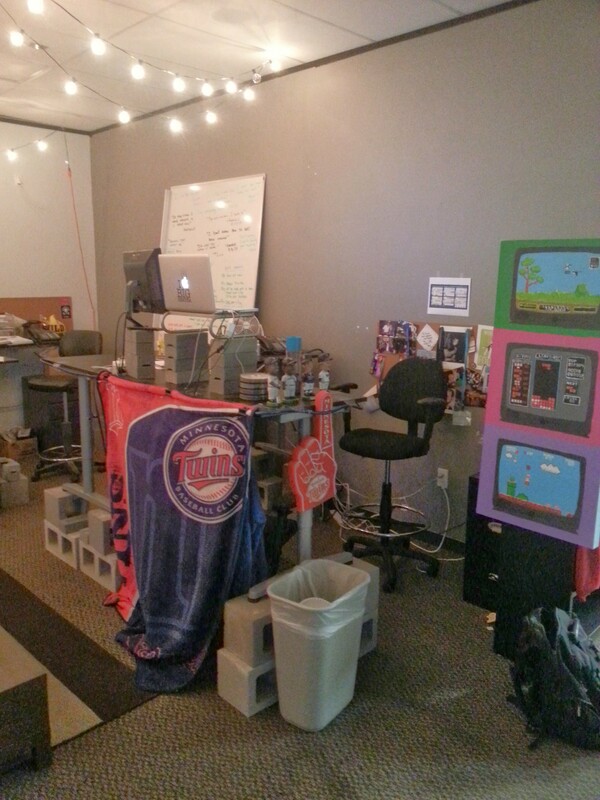 Here’s a look at my new work station/Minnesota Twins shrine. I went to Top Golf on Tuesday with colleagues from the office and some execs from the Carlsbad office, including CMO Harry, who I spoke with about starting my own golf-related web series. I’m beginning to brainstorm some ideas. Mark April 26-May 4 on your calendars as highly likely dates for our return to Minneapolis. We hope to make one big trip back before summer, in the midst of Lauren’s work travels. There has suddenly been some renewed buzz in the 1000 Question Interview series Jason LaPlant and I conducted around 2007 or so. And by “renewed buzz” I mean Jason and I have begun preliminary talks about doing a similar project all these years later. I am thinking of quitting running outside for exercise. First of all, I really hate doing it, although I do feel good about myself afterwards. Secondly, my legs/ankles/feet have been in severe discomfort for a very long time, probably half a year or longer. I won’t go so far as to say my legs are in pain, but they feel dead, or very heavy, tight and achy the minute I start running and it doesn’t go away. And yes I have tried resting, stretching, hydrating, etc. I think swimming might be my next thing, unless someone has some excellent advice for me. 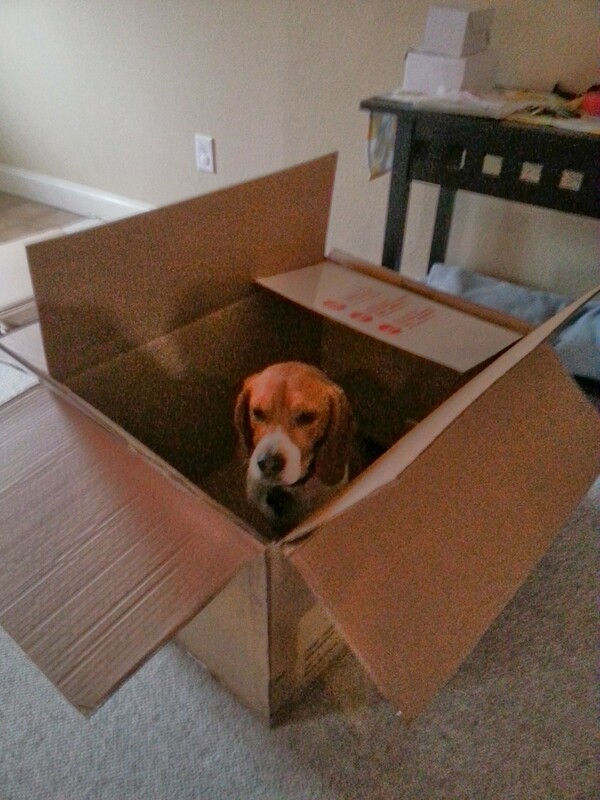 A final thought to leave you with today, for no particular reason… a beagle in a box. I can’t believe how much fun you have. Your living in a city that’s known for having fun and you seem to find it, even your office. How many people have a job that’s laid back and casual like yours? ENJOY!